Here is an updated ccMiner 1.7.6-r10 Widows binary of the Nanashi Meiyo-Meijin fork (source) with optimized Lyra2RE and Lyra2REv2 performance. 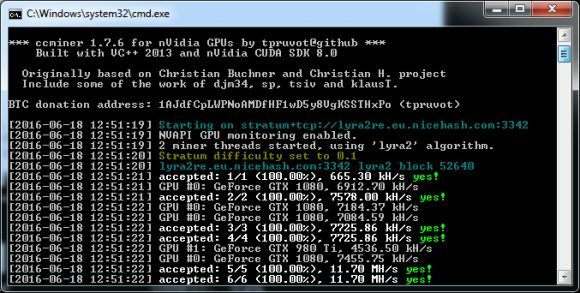 The latest r10 update fixes the hashrate issues that were present with other versions of ccMiner on the latest Nvidia Pascal GPUs such as GTX 1080 and GTX 1070. 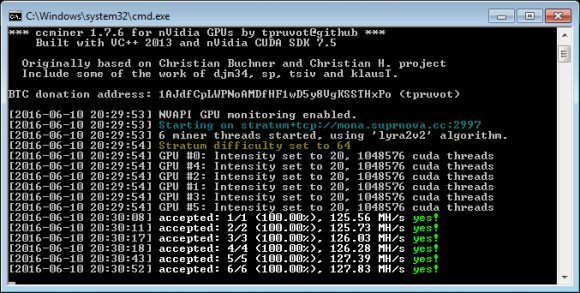 You can see a brief test of the performance of the new 32-bit Windows binary of the miner compiled with VS2013 and CUDA 8.0 below. Here comes an updated ccMiner 1.7.6-r6 Widows binary of the Nanashi Meiyo-Meijin fork (source) with optimized Lyra2REv2 performance. The latest r6 update might bring a slight performance increase in Lyra2REv2, however it significantly increases the performance of the Lyra2RE algorithm based on the few tests we ran, results of which you can find below comparing the r5 and r6 released on different Maxwell GPUs and the new Pascal GTX 1080. 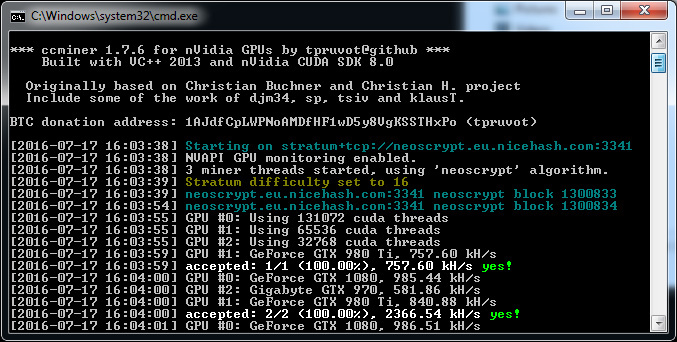 You can download a 32-bit Windows binary of the ccMiner 1.7.6-r6 fork from Nanashi Meiyo-Meijin compiled with VS2013 and CUDA 8.0 with a wider range of Nvidia GPUs supported – from Compute 2.0 all the way up to Compute 5.2 (we have only tested it with Maxwell and Pascal GPUs though). You can follow the development of this fork on the official dev thread, though it is in Japanese and you may need to use an online translation service. Here comes a new ccMiner 1.7.6-r5 fork from Nanashi Meiyo-Meijin (source) based on tpruvot’s fork of ccMiner, but with even faster Lyra2REv2 performance. The ccMiner 1.5.80-git SP Nicehash fork from yesterday with improved Lyra2REv2 hashrate was apparently based on the code from the same author, but the Windows binary we have compiled from the ccMiner 1.7.6-r5 source seems to be slightly more optimized and thus is a bit faster. Below is a comparison between the two released on different Nvidia Maxwell GPUs to give you an idea on what is the difference in performance. Apparently the optimizations for the Lyra2REv2 performance were made for mining Monacoin (MONA), buy you can mine any other altcoin that uses the same algorithm. 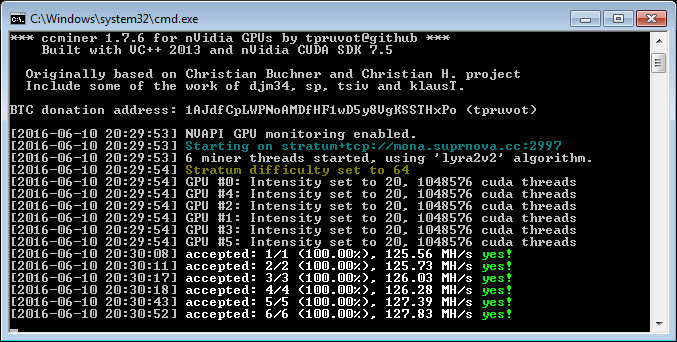 So here comes the 32-bit Windows binary of the ccMiner 1.7.6-r5 fork from Nanashi Meiyo-Meijin is compiled with VS2013 and CUDA 7.5 with a wider range of Nvidia GPUs supported – from Compute 2.0 all the way up to Compute 5.2 (we have only tested it with Maxwell GPUs though). There is no point in publishing a 64-bit binary as our tests have shown that it provides lower performance when compared to the 32-bit version that is available here. You can follow the development of this fork on the official dev thread, though it is in Japanese and you may need to use an online translation service.